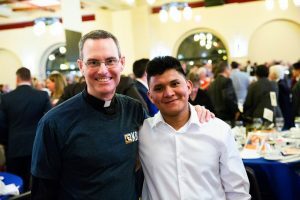 Father Sean and Fredys at the Ninth Annual KBI Dinner where Fredys shared his story with the assembled guests. Fredys arrived at the KBI comedor from Honduras two years ago, fleeing violence and recruitment from organized crime. When he decided to seek asylum, the KBI/Florence Project Legal Fellow took on his case. Despite the obstacles, his claim was approved, an example of how legal representation can impact outcomes. Today, Fredys lives in Virginia, and returned to Arizona last month to share his story at the KBI Dinner. In his hometown of Choluteca, Honduras, 26-year-old Fredys Sevilla experienced ongoing harassment and recruitment pressure by an organized crime operation, accompanied by all-too-common and deadly threats. As he explained to the supporters gathered at the KBI Annual Dinner, he remembers “nights and days with many nightmares.” He feared becoming a “slave to drug traffickers,” or being driven to suicide. The situation was dire and life-threatening, but the decision to flee was complicated, both fraught and inevitable. A father of two young sons—a toddler and a newborn, now 4 and 2 years old—Fredys didn’t want to leave his family, but he had little choice if he hoped to protect them from retaliation. If he could establish himself in the U.S., he could send remittances until it was possible to reunite with his sons. So Fredys headed north, traveling by train—jumping the rails and riding atop La Béstia (the Beast), as the cargo trains are called, in testament to the injuries, amputations, and deaths suffered by many who ride them—and arrived at the KBI comedor on May 17, 2017. There, he found safety, support, information about his options, and as he says, hope. He decided to seek asylum in the U.S., turned himself in at the port of entry, and was sent to a detention facility. At the time, the KBI/Florence Project Legal Fellow program had not yet started, but when Rocío Castañeda was hired that August and reviewed prospective asylum cases, she met with Fredys and chose to represent his case. As so often happens, Fredys’ prolonged detention took a toll—the separation from family and the uncertainty of his future weighed on him, and he felt despondent and distressed. In late November 2017, Fredys became eligible for bond under the Rodriguez v Jennings decision by the 9th Circuit, which required an automatic bond hearing at six months of detention, but he needed a U.S. citizen or permanent legal resident to sponsor him. Eventually, a Phoenix family opened their hearts and home to Fredys, met him, and wrote a sponsorship letter. Keally, a Northeastern University student then interning with the Florence Project, worked tirelessly to prepare documents for Fredys’ bond hearing. Seeing the depth of community support for Fredys, the judge awarded him a minimum bond of $1,500, paid by another generous couple. Fredys was released February 14, 2018, less than two weeks before the Supreme Court revoked the right to the Rodriguez bond and almost a year after leaving his home in Honduras. A few months later, Melanie Gleason, an immigration attorney, represented Fredys at his June hearing, offering her services on a pro bono basis. He was awarded asylum that very day! It was a huge victory for Fredys, and also further confirmation of the difference legal representation can make in an asylum process characterized by high denial rates. After securing asylum, Fredys continued to live in Phoenix for a few months, and then moved to Virginia, where with his sister, his brother, and his brother’s family live, awaiting their final asylum court dates. He’s employed doing electrical work, and attends ESL classes with the expectation of one day earning his GED. Determination, faith, the accompaniment of others, sound legal work, and good fortune—all played roles in Fredys’ successful asylum story. Though there are still challenges ahead, such as reuniting with his children, Fredys can now plan his next steps from a place of greater stability and safety. Watch the video of Fredys’ testimony at the KBI Dinner here: https://www.youtube.com/watch?v=oJHwcU0JLMY. A Jesuit priest, aged 84, I don’t have money to contribute to KBI, but I remember you in my prayers and thank all of you for the important work you are doing for the Church and the people of Central America. One of the members of my community, Fr. Jack Barron, spends two months each year in Honduras at a retreat house where he offers the spiritual exercises to religious and lay persons. THANK YOU so much Fr. Sean and all those working with him there at Kino. –Lucien Longtin, S.J..